OH YES PLEASE, hopefully these are on their way to France. Great job there Alison. These are gorgeous, liking the verse and that rose over the top is lovely. 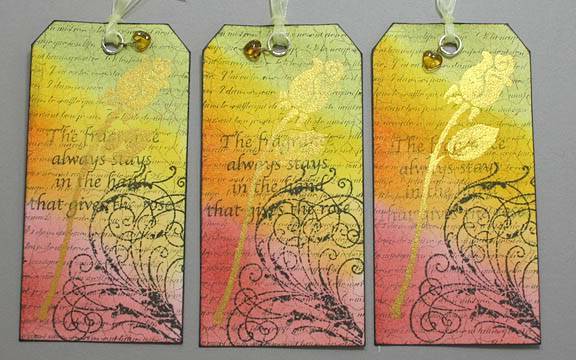 Beautiful tags, love the colours. Lovely colours Alison and like the little heart charm at the top. i got one of these and the colour is amazingly bright and cheerful,lovely it is . Another gorgeous set of tags, so I had to keep one of these too. Fab, I got one of these as well. These are very nice - reminds me of spring. The last set I have looked at and one of the best. Rather 'Arty'. Lurve the colours on these. Great work.